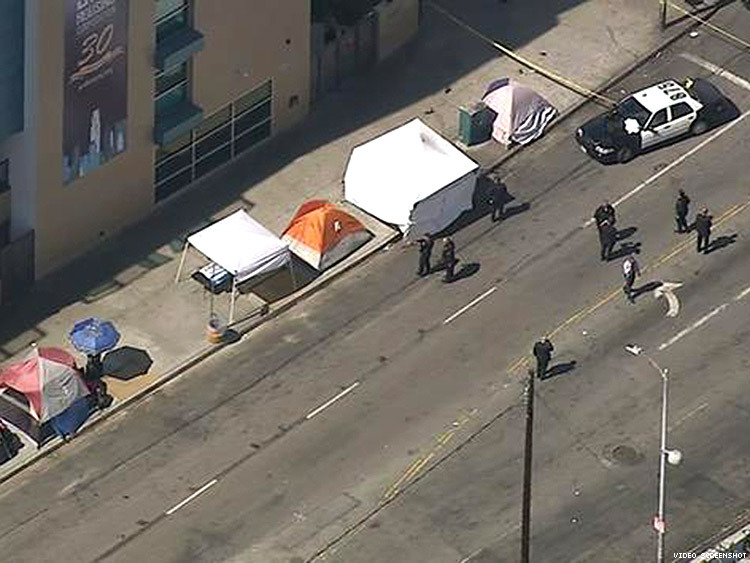 A 32-year-old transgender woman of color was shot and killed Wednesday at approximately 1:20 p.m. within the Skid Row area of downtown Los Angeles, according to local news station KABC-TV. Officer Tony Im of the Los Angeles Police Department told the Los Angeles Times that the shooting took place in the 500 block of South San Pedro Street, after the alleged gunman opened fire on the woman during an apparent intimate partner dispute. The woman, reportedly shot in the head, was pronounced dead at the scene. Anita U. Nelson, chief executive of SRO Housing Corporation, identified the victim as Kourtney Yochum, according to the L.A. Times. Messages sent by Facebook to The Advocate allege that the deceased used the name Quartney Davia Dawsonn-Yochum on Facebook. Yochum lived in Gateways Apartments, which the L.A. Times describes as "a 107-unit permanent supportive housing project for formerly chronically homeless individuals." “It is mind-boggling; it happened out in the open,” Nelson told the L.A. Times. Despite the area's propensity for violent crime, an "angry mob" on Skid Row was shocked at the particularly "brazen" shooting of Yochum in broad daylight, and rushed to surround the alleged shooter, reports Los Angeles TV station KNBC. After the mob intervened, a security guard took the suspect into custody until police arrived, Im said. The suspect was described as a man in his 20s. His identity will be released after he's booked by police, Im said. A gun was recovered at the scene. The suspect is believed to be Yochum's ex-partner, according to KNBC. He allegedly shot her while she stood in front of the Gateway Apartments, where Yochum was residing as she tried to build a new life for herself. For a brief time after the authorities took Yochum's body away, KNBC reported that the deceased's black, strapped, low-heeled shoes, and a yellow plastic cup marked the spot where she was killed. The alleged homicide follows that of several other reported murders of transgender people in the U.S. this year, including Jasmine Sierra in Bakersfield, Calif., 30-year-old Louisiana trans man Demarkis Stansberry, Texas trans woman Monica Loera, 24-year-old Arizona trans man Kayden Clarke, and 25-year-old Philadelphia trans woman Maya Young. A 2012 report from the National Coalition of Anti-Violence Programs found that transgender individuals are nearly two times as likely to face threats, harassment, and violence in intimate relations based on their gender identity. “Transgender people face increased risk of violence because of their gender identity and transphobia within intimate partnerships, ” said Aaron Eckhardt, training and technical assistance director at Buckeye Region Anti-Violence Organization in the report. The LAPD did not respond to queries by press time.